When the gladiator shoes came out in the market it was designed for different purposes. From flat strappy shoes to high heels sandals and this time for knee high gladiator sandals. It is a goddess look, rocker, ancient Grecians inspired sandals. Knee high flat gladiator sandals that comes in basic colors of white, black, and brown. Other variations of knee high gladiator shoes in stiletto heels having different designs of the straps of the sandals. 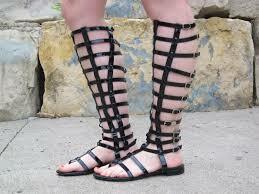 The roman gladiator inspired sandals has invaded the Hollywood scene and most celebrities wear it with comfort. The stylish Kourtney Kardashian wearing her knee high gladiator sandals on different occasions. Gladiator shoes are not just for celebrities of be worn during summer. It can be worn on different occasions and with different outfits depending on your mood. It can hype up your fashion sense with this different styles of the gladiator sandals especially the knee high sandals.